The American Civil War was fought between the southern states and the northern states. The southern states didn't want the North telling them what to do or making laws they didn't want. As a result, many southern states decided to break away and form their own country called the Confederacy. The North, however, wanted to stay as one united country; and so a war began. The Civil War, and the major events leading up to the war, lasted from 1860 to 1865. Harpers Ferry Raid (October 16, 1859) - Abolitionist John Brown attempts to start a slave rebellion by taking over the Harpers Ferry arsenal. The uprising is quickly put down and John Brown is hanged for treason. Many people in the North, however, consider him a hero. Abraham Lincoln Elected President (November 6, 1860) - Abraham Lincoln was from the northern part of the country and wanted to put an end to slavery. The southern states didn't want him president or making laws that would affect them. 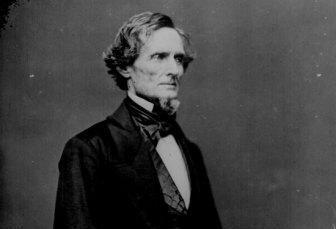 South Carolina Secedes (Dec. 20, 1860) - South Carolina became the first state to secede, or leave, the United States. They decided to make their own country rather than be part of the USA. Within a few months several other states including Georgia, Mississippi, Texas, Florida, Alabama, and Louisiana would also leave the Union. The Confederation is formed (Feb. 9, 1861) - The southern states form their own country called the Confederate States of America. Jefferson Davis is their president. Abraham Lincoln becomes President (March 4, 1861) - Now that President Lincoln is in office, he wants to restore the Union. In other words, get all the states back into the same country. The Civil War Begins (April 12, 1861) - The South attacks Fort Sumter South Carolina and starts the war. More States leave the Union (April 1861) - within a short period of time Virginia, North Carolina, Tennessee, and Arkansas all leave the Union to join the Confederacy. Union Blockade (April 19, 1861) - Abraham Lincoln announces the Union Blockade where the Union Navy will attempt to keep supplies from entering or leaving the Confederacy. This blockade will weaken the Confederacy later in the war. 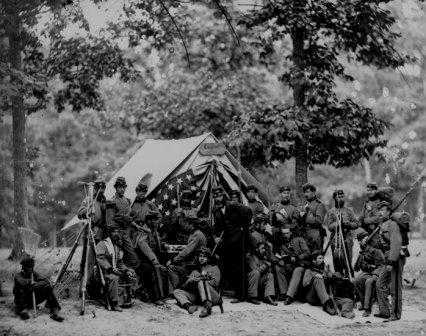 Many Battles of 1861 and 1862 - Throughout 1861 and 1862 there were many battles where lots of soldiers from both sides were wounded and killed. 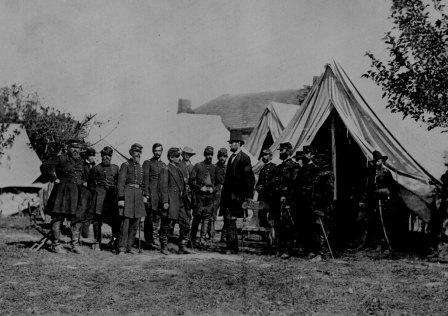 Some of the major battles include the First and Second Battles of Bull Run, The Battle of Shiloh, The Battle of Antietam, and the Battle of Fredericksburg. There was also the famous sea battle between the two ironclad battleships the Monitor and the Merrimac. These ships had iron or steel plates on their sides for armor making them much stronger and changing war on the seas forever. Emancipation Proclamation (Jan. 1, 1863) - President Lincoln issues an executive order freeing many slaves and laying the groundwork for the Thirteenth Amendment. The Battle of Gettysburg (July 1, 1863) - A major battle where the North not only wins the battle, but starts to win the Civil War. Sherman Captures Atlanta (Sept. 2, 1864) - General Sherman captures the city of Atlanta, Georgia. Later in the year he would march to the sea and capture Savannah, Ga. On his way he would destroy and burn much of the land his army passed through. General Robert E. Lee surrenders (April 9, 1865) - General Lee, the leader of the Confederate Army, surrenders to General Ulysses S. Grant at The Appomattox Court House in Virginia. President Lincoln is Assassinated (April 14, 1865) - While attending the Ford's Theatre, President Lincoln is shot and killed by John Wilkes Booth. Reconstruction of the South (1865-1877) - The South is occupied by Federal troops while state governments, economies, and infrastructure are rebuilt.